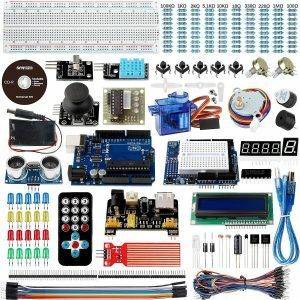 If you are an electronic geek or have a passion for the electronics and robotics, but not sure where & how to start, then the best Arduino starter kit is a reliable way to begin. One of the main reason for this is that the Arduino starter kits are easy to use and relatively inexpensive. There are lots of open source code, and the examples of Arduino projects freely available online. So you can have a quick and easy programming with your Arduino board and can build a useful and innovative project in no time. From opening your garage door automatically to do surveillance around your home, any electronics project in your mind can be completed with the help of an Arduino board and other essential components of the kit. Here, I have reviewed and compared some of the best Arduino starter kits available today. Buy one of these and start your seamless journey in electronics. Without any further ado let’s start the list. 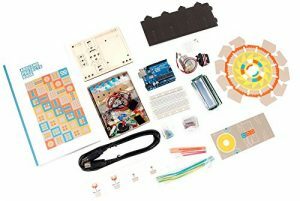 This official Arduino starter kit is introduced by arduino.org. It is one of the best packages available today providing a good way to get started with your first Arduino project. It helps in doing quick and easy coding with electronics. Check the full review of official Arduino starter kit on my blog. The kit includes a project book with 15 easy and fun projects in a step-by-step tutorial guide covered in about 170 pages. The Arduino Uno Rev3 board comes with the kit for helping you to build creative projects. It also comes with some useful sensors and actuators. Projects like a digital hourglass, door opener, musical device, etc. can be done quickly with the help of this bundle. This kit is strongly recommended for the beginners. The kit is great for beginners as it is supported officially, but it does not include a storage box, and some components are lacking if you want to create an intricate Arduino design. Apart from these two dislikes, I really enjoyed working with this official bundle and strongly recommend it for the Arduino lovers. Super starter kit with an Arduino Uno, Mega 2560 & Mega 328 kit from SunFounder is an upgraded version of the previous SunFounder Super Arduino Starter Kit. It is one of the most sought Arduino beginners kits in the market today. The kit includes a guide to 19 projects which are easy to learn and implement for the beginners who are interested in Arduino. It includes a full set of useful and standard electronic components of Arduino with breadboard images and schematic diagrams. The source code included with the detailed tutorial of each Arduino project. A protective case with eight different grids helps you to store the components with ease after use. LEDs, jumper wires, breadboard, USB cable, resistors, switch, fan, and other useful material included in the package. You can buy this SunFounder Arduino Super Starter Kit on Amazon with either UNO R3 board or a Mega 2560 R3 development board. Vilros introduces the ultimate Arduino Uno Starter Kit enabling you to get started with a number of electronic projects. The package includes the Uno R3 board and R3 Ethernet shield which is compatible with Arduino. The list of the best Arduino starter kits cannot be completed without including this Ultimate Arduino Uno Starter Kit from Vilros. The kit includes the 72-page book with full colored instructions, which help you to build your design easily. It covers a total of over 190 electronic components and parts. Few of the main parts include USB cable, LEDs, Breadboard, Holder, DC Motor, Jumper Wires, Small Servo, Relay, etc. It also includes a 16*2 LCD module with a soldered pin header which can be used for all the Arduino LCD projects. If you are a beginner in the C/C++ programming, then you will find the guide useful which is included with the kit. By containing all the components in the single package, helps you save almost 40% of the total cost on your spendings for the project. The kit is handy for beginners as well as for the experts of Arduino programming. Go through the tutorial guide, and you will master the basics of using the components. Build your own custom project using your skills. The Osoyoo starter kit is developed specially for the Arduino beginners who are interested in getting started with Arduino DIY projects. The kit comes with Arduino Uno R3 board which is one of the most used prototyping board among the designers. It includes a set of most useful electronic components of Arduino DIY kit. All the parts and material are tested and selected carefully so that beginners can use them without any hesitation. This thing helps to operate the kit easily. 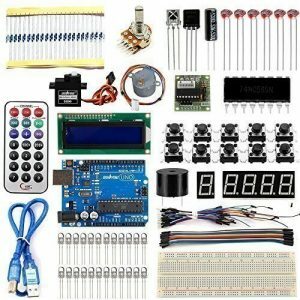 If you finish all the projects with this kit successfully, then you can introduce yourself as an intermediate Arduino player! Total of 20 different items and 15 project manuals come at an affordable rate. Not only the project tutorials, but you will also learn the basic concepts and how to use each component included in the package. 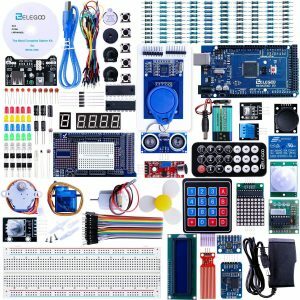 I am feeling delighted and excited by putting this kit in this list of the best Arduino Starter Kits. The reasons I already mentioned above for that. From the manufacturers of top sought devices like 3D printers, Raspberry Pi boards, etc., this complete Arduino starter kit got the introduction to the electronics world. The Elegoo provides the powerful Arduino Mega 2560 board and other 200 pieces of components which makes this kit perfect for the entry-level designers. An included PDF tutorial consisting over 35 chapters helps you learn & implement the projects step-by-step. Pre-soldered sensor and LCD module come with pin header which makes your task even easier. LEDs, diodes, buttons, wires, sensors, and other components come in a well maintained, clearly listed package. You will get the learning on all about the Arduino, its working and how to use it for making your daily life easier by using this kit. Even if you do not have any prior electronics circuit’s knowledge, you can quickly implement projects with the help of step-by-step instruction guide that comes with the kit. Smraza introduced this ultimate Arduino kit which comes with the highly recommended Arduino UNO R3 board, Arduino Nano, Arduino Mega2560, servo-stepper motor, and all other essential components for your electronics project. The most important benefit of getting this kit is, you do not need to solder any of the parts and can directly use them in your design. The package includes 47 useful parts with other 160 components that are needed to complete any of your Arduino projects. It comes with a PDF tutorial containing 26 different projects with sample codes and step-by-step instructions. You will learn about the definition, working, and usage of various Arduino sensors, motors, LCD modules, Ardu Cams, and many other electronics components. Not only the included parts are the limit, but you can also even expand this kit beyond your imagination by using external sensors and modules. In other words, it is the most expandable super project kit. The creative project ideas start from some most basic things and end to the most complex circuit designs with Arduino boards. So from beginners to the pros, everyone can use this kit without any hassle. If you are just jumping into the electronics field and want to tinker with some most potent and easy working circuits, then get this Arduino kit from Smraza. When we talk about Arduino, how can we forget to mention about the starter bundles from Adafruit? This Americana Arduino starter pack is becoming popular amongst the worldwide coders and electronic circuit designers. It comes with the currently the best Arduino board, i.e., UNO R3. This starter bundle comes with every component that can help you finish your Arduino projects easily. The tutorial guide will help you to learn the working and usage of microcontroller boards and electronic components in an easy & fun way. Even if you don’t have any circuitry experience, you can make creative and useful designs by following the detailed instructions. 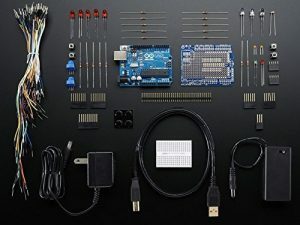 This kit includes ready to use UNO Rev3 board with Atmega328, a USB cable, breadboard, power adapter, switch, battery case, LEDs, connecting wires, resistors, potentiometers, pushbuttons, and sensors. 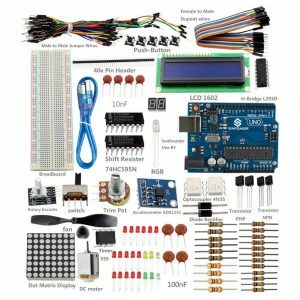 If you are wondering about the working of the Arduino, but looking for the easy yet powerful way to start, then don’t wait to bring this Adafruit starter pack at your lab. The Best Arduino Starter Kits are the knowledgeable and self-learning resources for the rookies in the robotics field and also for those who are just beginning with their initial Arduino projects. The kits are also recommended for the pros in Arduino programming and electronics and who want to enhance their skills by making complex designs with easy-to-use tools and components. But, how you decide which kit is better for the others, especially when you are just stepping into the electronics field? Well, to help you out, here I have explained a quick buying guide on how to choose the best Arduino kit for beginners. All the Arduino kits bundled with useful components and in-depth information. But, you can not buy all the available packages at a time. Check these below essential things when you are making your mind to buy an Arduino kit. Yes, this is the first thing you should look for a starter pack. The most important part of any kit is its master component, and that is the microcontroller which comes with it. Almost all of the modern kits come with the Arduino UNO R3/Mega2560 board. FYI, the UNO Rev3 is the flagship Arduino board which lets you create wonders using Arduino IDE. So, it is advisable to check the compatibility of the included microcontroller with the UNO board. One thing you should keep in mind that, when you are buying a starter kit, that means you are getting a package of a powerful circuit board and all other essential components to let you get started. The kit should contain enough number of parts & elements to help you do various Arduino projects without buying anything externally. Not necessary that you have a prior knowledge of tinkering with Arduino when you buy an Arduino starter kit. So, it should come with a well-managed, detailed, and informative instruction manual to make you learn from connecting wires in a breadboard to code some intricate designs with your board. Though I mentioned the cost of the kit, at last, it is also an important and considerable thing when you are spending your valuable money on something. Check your budget, see the price of the starter bundle and look for the things it provides. If all matches with your needs, then you can go ahead freely. 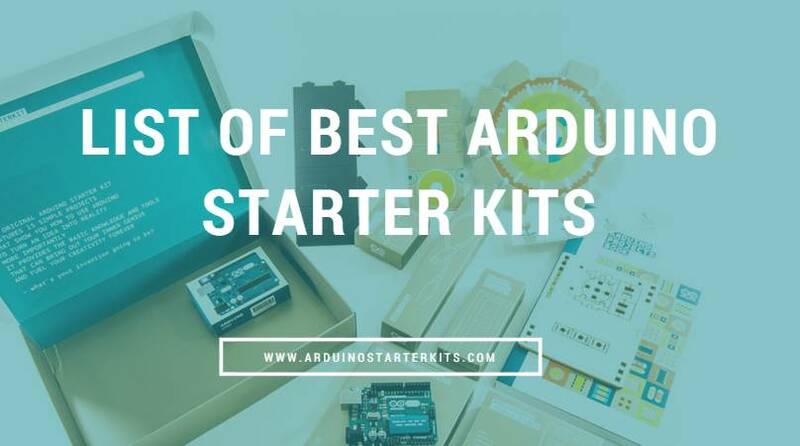 Hope you enjoyed the reading of the list of the Best Arduino Starter Kits and have an eagerness to start your own Arduino project with one of these kits. I am always looking for valuable thoughts of my readers (you) and give importance to their helpful suggestions. So, I welcome you for any inputs you want to provide here. The Elegoo and SunFounder kits provide a significant number of components while the Vilros and Osoyoo are the ones which are quite famous among the designers. The Smraza can be turned into an excellent choice for newcomers while the Adafruit is a big name in the industry. But, if you ask for my favorite, I will go to the official Arduino starter pack without any doubt. It comes with official support from the Arduino, and so you will have direct access to the Arduino community. It helps you to get quick, easy, and variety of solutions for your A to Z query regarding Arduino. 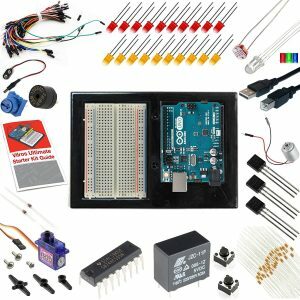 I continually research for the latest and recommended Arduino starter kits and will update this list with new awesome packages that I find. So stay connected with the site and build your own innovative design with Arduino. All the best with your Arduino projects! I really appreciate if you like and share this list with your buddies.